some bloggers like to schedule posts days or weeks in advance. i most often post one day at a time. there are some definite pros and cons to each method. i had a different post planned for today. i made the most delicious easter treats a couple of weeks ago and can't wait to share them with you. i planned to post that today, BUT last night i sliced my finger with a knife...again. i don't know what my problem is. minus my hip surgery, i've made it 34 years (yes 34. i know. you would never have guessed, but it's true) knock on wood without stitches, but my luck might be running out. since the first of the year, i think i have cut my finger with a knife at least 4 times. last night was pretty bad. i got nervous enough to google "how to know when you need stitches". turns out the internet is pretty informative. the first 2 sites were webMD and wikipedia. after reading both, i decided i could hold out until the morning. the real question is how do i prevent cutting myself in the first place?!? HELP!!! Owww! Did you end up needed stitches? Prayers for fast healing! True story, I worked in a restaurant starting at the age of 15 and learned some pretty mad knife skills, never cut myself once. Starting cutting hair and it was a bloodbath! Maybe you should google how to cut things properly (that sounded sarcastic, I swear, I'm serious). Learning how to use a knife properly should help you minimize your injuries. 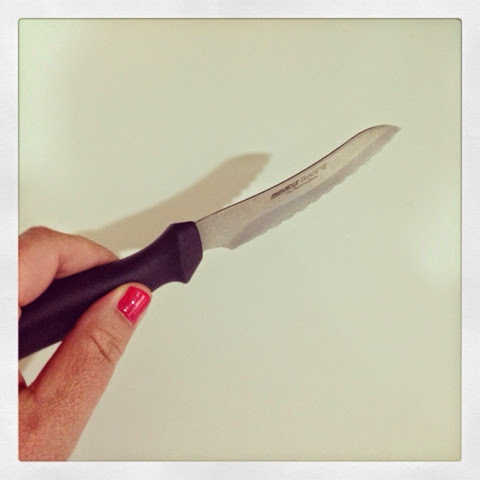 I still chop with a giant chefs knife and it freaks most people out! You might want to look into a cut glove! Will prevent those little nicks that happen in the kitchen! Oh, Aubrey! Be more carfeful :) They do have knife cutting gloves, I got my husband a pair for his mandolin slicer! I'm cringing thinking about cutting yourself with a knife. :/ I'm always so paranoid when I'm using one, but I don't really have any tips. Let me know if you find any good ones! We have cheap, probably super dull knives. The knife has slipped before but don't cut into my hand. Probably not the solution you're seeking, but hey, it works for me! I'm surprised I haven't cut myself... Every time I use my mandolin slicer my husband cringes!